** Solemnised by Priests, Licencees and Marriage Registrars.Extract of marriages registered by licenced Marriage Registrars, Priests is given in the office of the Inspector General of Registration, 100-Santhome High Road, Chennai 28. ** Marriage Extracts should be applied by bride /bridegroom/ parents. In case, the mentioned persons are unable to come personally any one with authorized letter from either bride or bridegroom can apply. ** The Indian Christian Marriage Extract will be issued only after original Marriage Extract issued by Priest. It should be forwarded to this office through the respective District Registrar Office concerned. ** In case of Marriage extract (RC) received directly from “ARCHDIOCESE OF MADARAS(SANTHOME)”, then Marriage Extract will be issued without the forwarding letter from District Registrar Office concerned. ** If the Self Addressed Stamped envelope is given by the applicant, Marriage Extract will be sent by Post in the case of extract applied with original along with forwarded letter from District Registrar Office concerned. ** The Extract will be issued after searching the Registers for the year mentioned in the application and if finds the same. ** If the marriage entry is not available in the year as mentioned in the application, then the Extract may be applied along with the original marriage extract (Schedule IV Sec.32 & 54) issued by Priest where the marriage was done and with the covering letter forwarded by the respective District Registrar Office”. ** If any entries are not available in the Registers, report of “No Entries” can also be obtained. ** Applicant should ensure the correctness of the extract by getting a sample extract before pasting the Hologram stickers. ** The Indian Christian Marriage Registers for the year from 1872 to 1961 is kept in the O/o. Deputy Inspector General of Registration situated at Rajaji Salai, Chennai. For those period the Extract will be issued after searching the records from that office. ** Under the Dowry Prohibition Act, demanding or accepting dowry, directly or indirectly is an punishable offence. ** Fine of Rs.5000/- or imprisonment upto 6 months or both. ** District Registrars are authorised to sanction prosecution. ** Registrants may lodge complaints with the District Registrar. ** Marriages solemnized before the Registering officer or in any other form . ** Bridegroom/Bride should have completed 21/18 years respectively . ** Anyone of the following place should fall within the jurisdiction of the Registering officer. ** Proof for all these shall be given. ** Notice of intended Marriages. ** If no objection for the marriage is received within 30 days from the notice,marriage will be registered . ** Marriages to be solemnized before the Registering officer or already solemnized . ** Bridegroom/Bride should have completed 21/18 years respectively at the time of marriage and the marriages already solemnized both should have completed 21 years at the time of registration. ** Notice of intended marriages should be given in triplicate to the jurisdictional Sub Registrar for registration and the notices will be displayed in the Sub Registrar Offices where bride and bridegroom have permanent residence. No need of personnel appearance of bride and bridegroom is required for giving notice. ** If no objection for the marriage is received within 30 days from the notice, marriage will be solemnized /registered and at that time the bride and bridegroom must present with witnesses. ** Marriages shall be solemnized/registered within 3 months from the date of Notice. Otherwise fresh notice should be given. ** Bridegroom/Bride should have completed 21/18 years respectively. ** Both of them should be Hindus/Sikhs/Jains/Buddhists. ** Any one of the following place should fall within the jurisdiction of the Registering officer. ** Both of them should be Hindus, Buddhist, Sikhs . ** In addition to the above memorandum in duplicate with 4 passport size photograph for bride and 4 passport size photograph for bridegroom should be submitted. 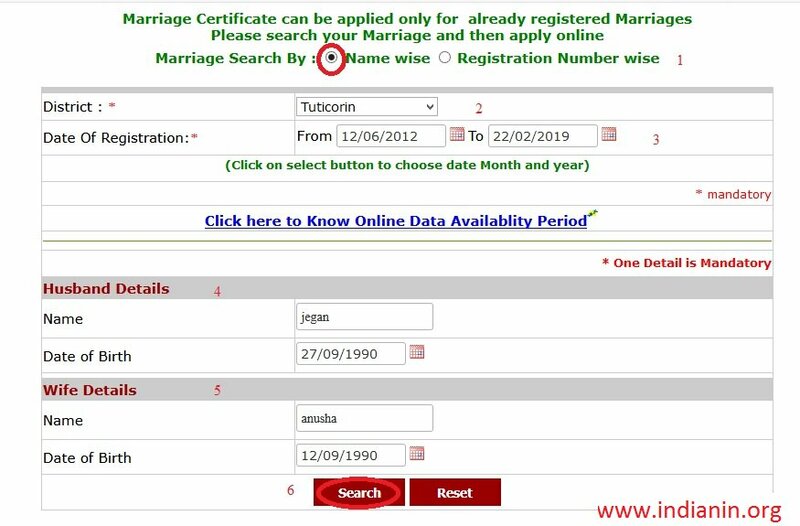 ** Provided that no search fee shall be levied for grant of a certified copy of an entry in the Hindu Marriage Register on application at the time of registration of Marriage. 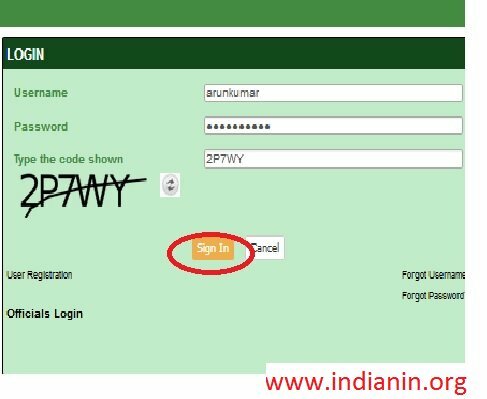 ** Provided further that an application fee of Rupees live in the shape of court fee labels affixed to the application shall be levied for each of application presented for grant of such certified copy. Please search your Marriage and then apply online. Where a marriage performed can be registered under the Tamilnadu Registration of Marriage Act? What are all needed? The marriges performed under any religion/ non-customary can be filed with the Sub Registrar where the marriage is performed. ** Memorandum (application) should be filed in duplicate. ** Requirements of personnel law should be fulfilled. ** Bride and bridegroom may be from any religion but should be citizen of India. ** Memorandum should be filled with Sub Registrar within 90 days of marriage. ** With payment of fine it can be filled in the next 60 days. ** Proof of marriage, age, residence, individual identity card for both and for two witnesses, passport size photo for bride and bridegroom 4+4 required. The marriages performed in Tamilnadu only can be filed. The memorandum should be filed with the Sub Registrar in whose jurisdiction the place of Solemnization belongs.